﻿ How to Check SFP+ Module Optical Signal Strength? SFP optical transceiver is a hot-swappable, compact component that provides fiber connectivity for optical networking. They support various applications like Fibre Channel (FC) switches, SONET/SDH network, Gigabit Ethernet, high-speed computer links, and CWDM and DWDM interfaces. When connected to switches, the optical signal strength of SFP modules is a critical parameter to ensure the normal working of the whole connections. This article will introduce the method of SFP module signals measurement and how to check SFP module optical signal strength. Generally, the signal strength of SFP module includes two parts: Tx power and Rx power. The former one stands for the transmit power signal, and the latter stands for the receive power signal. For a normal SFP transceiver, the value of the Tx and Rx power lies in a specific range, in which the SFP transceiver can work normally. Take Cisco GLC-SX-MM 1000BASE-SX SFP as an example, its transmit power range is -3 to -9.5dBm, and the receiver power range is 0 to -17dBm. If either the Tx or Rx is in the -30dBm or lower range, it means there is no actual signal being transmitted or received. The strength of optical signals directly determines whether the network connections can work normally or not. If the Rx power is not strong enough, there will be no signals in the optical links. That’s why a long-reach transceiver or an optical amplifier is needed in long haul transmission. And if the Rx power is too strong, the SFP module will be damaged. 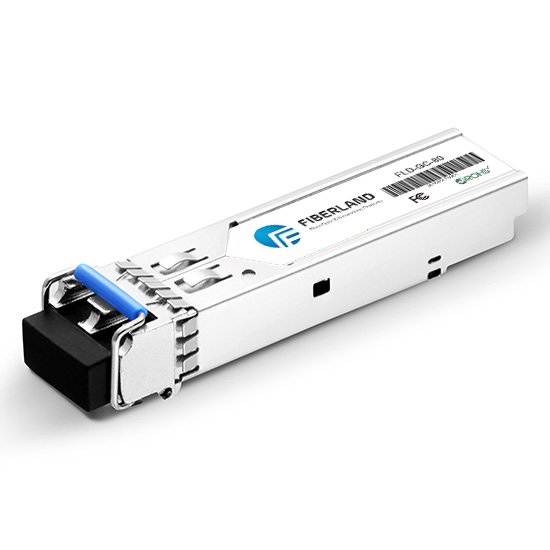 Therefore, a quality SFP transceiver is the basic guarantee for a smooth connection. Generally speaking, there are two common methods to measure optical signal strength: Microwatts (mW) and dBm which is short for decibel of the measured power to one millwats. The former one measures optical signal strength by power, while the latter describes signal strength with decibels. Different vendors may adopt one of them to describe signal power. For instance, Cisco switches are used to adopt dBm to measure the power, while Brocade switches get accustomed to using mW. Therefore, sometimes there is an equation between these two methods. Here are some figures recommended by EMC. Notes: Optical signals get attenuated during transmission. To ensure the transmission quality, network operators also need to pay attention to the attenuation caused by optical transceivers. There is the acceptable light attenuation range of some common modules rate. How to View SFP Module Optical Signal Strength? To determine if a SFP optical transceiver (transmitter and receiver pair) is operating at the appropriate signal levels, the data sheets of SFP transceiver should be referenced. It often provides critical information such as link reach, fiber type (single-mode or multimode), transmitter output power range and optical receive power range, etc., which is helpful. In addition, some switches like Cisco and Brocade SAN switches will offer CLI (Command-Line Interface) reference for users to view SFP modules details which includes SFP rate, serial number, Part Number, accept/send direction optical signal strength. 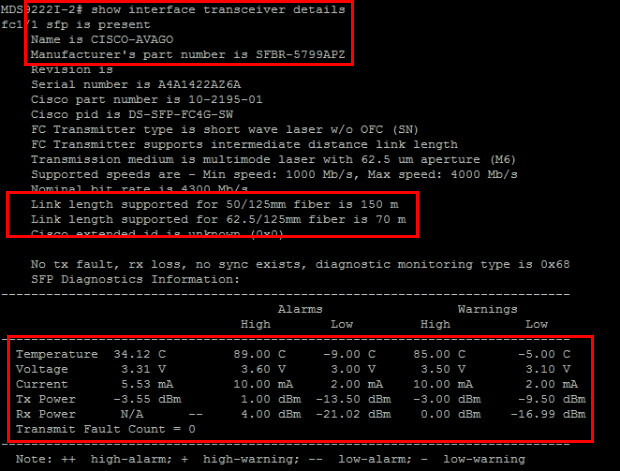 The following pictures show the results of SFP module details in Cisco and Brocade switches. Of course, the optical signal strength is included. 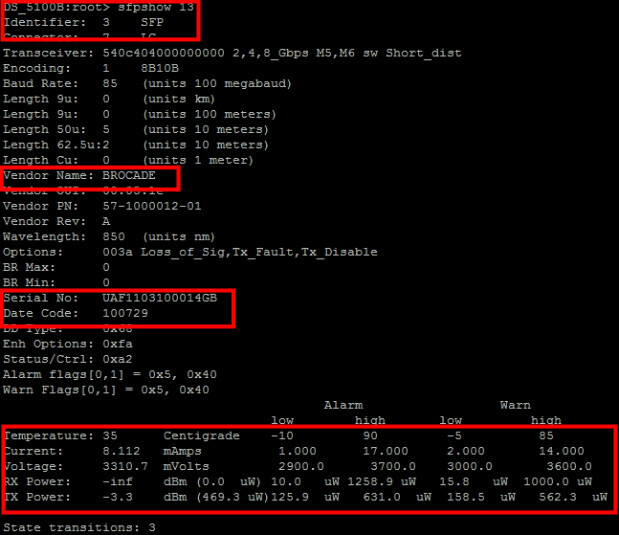 From the result above, we can see that the method that Cisco and Brocade marking the signal strength is different. But both of them offer the current signal strength and the range of effective optical signal strength of the SFP modules. As long as the SFP signal strength lies in the valid range, the SFP module can be considered to work normally. Optical signal strength is an important element affecting the whole optical links. This post gives a simple introduction to it and how to view SFP module signal strength in Cisco and Brocade switches. Hope it would help you.